China pumps out machinery, cellphones and smog, but it runs on coal. It is by far the largest burner of the black stuff so, when Chinese factories start slowing down, it is usually time to sell your coal stocks. A sharp economic reversal in China this year remains unlikely, but July data was strikingly weak after stellar second-quarter growth. That is bad news for coal firms everywhere, and especially for China’s state-owned behemoths like Yanzhou Coal, struggling with crushing debt burdens and fickle Chinese regulators. Yanzhou is roughly half-owned by the Shandong provincial government and its holding companies, but most of the big shareholders in Hong Kong are Western institutions, according to FactSet. 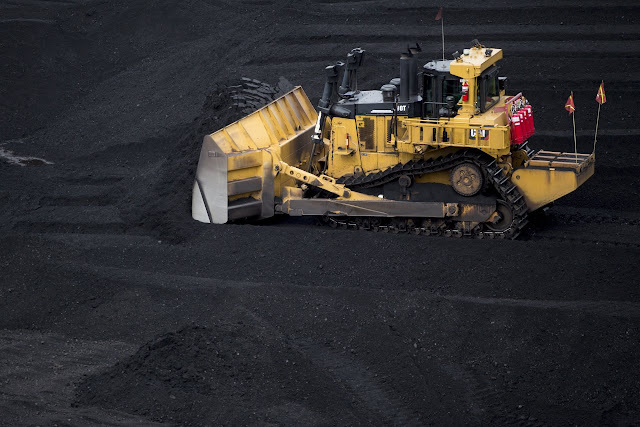 The coal price rebound fueled by Chinese stimulus this year has pushed Yanzhou’s stock up around 40% year-to-date and its first half sales up 82% from a year earlier, but the firm hasn’t used the breathing space to pay off much of its borrowings. Debt still clocked in at a vertigo-inducing 156% of equity in June. Instead, Yanzhou is pursuing expensive acquisitions in Australia through its subsidiary Yancoal , YAL 8.70%▲ which recently agreed to buy Rio Tinto’s Hunter Valley coal assets for $2.69 billion. Cash-strapped Yancoal is issuing $2.5 billion in new equity to finance the deal over the objections of minority shareholders, with Yanzhou itself on the hook for up to $1 billion. Yanzhou also plans to boost capital expenditures by about 20% in 2017. None of this would matter that much if China’s economy was poised for another 12 months of above-trend growth. Unfortunately, it is increasingly clear that isn’t the case. 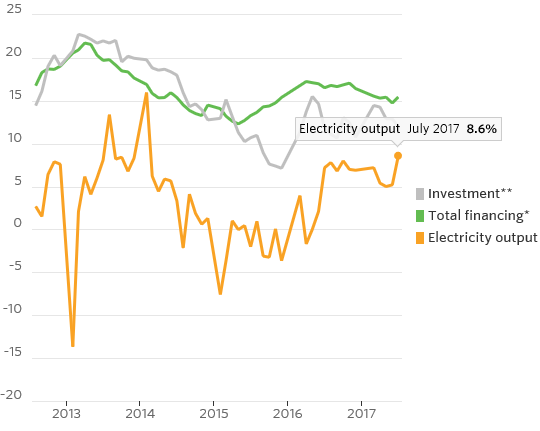 Chinese policy makers are tightening credit gradually ahead of an important Communist Party meeting this fall, and that is starting to affect investment and industrial output. Chinese real-estate investment, the biggest driver of global materials demand, including coal, grew at its slowest pace in over a year in July, and infrastructure investment also ticked lower. Industrial output weakened across the board. Two other bearish factors for coal and electricity demand are about to kick in. First, it has started raining again in southwest China. Dry weather this spring pushed hydropower utilization down the most since 2012 and coal power plants’ run rates sharply higher. That dynamic is now moving into reverse as hydropower ramps up again. Furthermore, plans to shutter more energy-intensive steel and aluminum plants this winter during the peak pollution season—on top of steel capacity cuts already enacted—could deal another blow to power demand. Metal smelting alone accounts for around 20% of power consumption in China. Things are looking brighter for the global coal sector following the disastrous price crash of 2015—including the U.S., where the sector is seeing a revival—but things are just about as good as they can possibly be right now. Next year will be tougher. Investors should take the opportunity to dig out their cash while the digging is good. ON A rainy afternoon, two sharply dressed men talk business and clink $40 glasses of wine at the Trump International Hotel, a few blocks from the White House. The recently opened hotel, which offers $65 steaks and a $100 cocktail made with raw oysters and caviar, has become popular among cabinet members, lobbyists and curious journalists. It would seem the swamp monsters, whom President Donald Trump once pledged to purge, are not doing too badly. Lobbying expenses for the first six months of the year amounted to $1.67bn—the most since 2012—according to the Centre for Responsive Politics (CRP), a watchdog. The figure might have been even higher if Republicans had managed to convert their undivided control of Congress and the White House into legislative accomplishments. Instead, repeated attempts to reform Obamacare ran into the sand and the prospects for tax reform are uncertain. Yet, strangely, the number of registered lobbyists has fallen sharply. 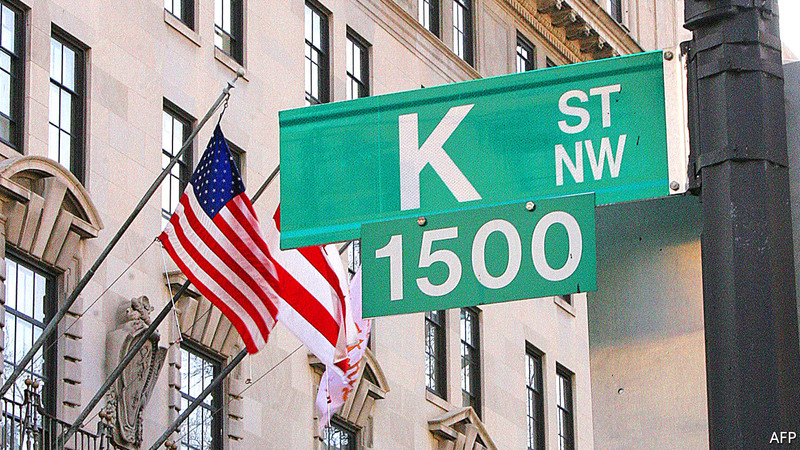 In the second quarter of 2017 there were just 9,791—a third fewer than the 15,000 milling about K Street and other lobbyist haunts ten years ago. The number of dollars spent per registered lobbyist increases every year. Either the price of persuasion has shot up, or people are not being counted properly. The answer is almost certainly the latter, and the man to blame is Barack Obama. The last president, who had promised to “take the blinders off the White House”, instituted strict rules limiting lobbyists from serving in his administration. Some influencers went underground, dodging registration requirements by not spending more than 20% of their time working for any single client. By one estimate, the official rolls capture only one in two lobbyists. Of the 2,100 lobbyists in 2016 who did not register in the first quarter of 2017, 58% stayed at the same company, according to the CRP. Many still seemed to be working to influence federal policy. Purging lobbyists may be as hard as eradicating illegal drugs, and for the same reason: strong demand. So argue Lee Drutman and Steven Teles, two academics, who reason that Congress is increasingly incapable of creating policies. The number of workers in the Congressional Research Service, Congressional Budget Office and Government Accountability Office, the internal information services that provide unbiased reports to members, has dropped by 40% since 1979 even as legislation has grown more complex. Paid influencers, including those without the word “lobbyist” on their business cards, fill the gap. Since Congress is unlikely to hire many more wonks, the Trump International Hotel will continue to sell fishy cocktails and pricey rooms. Mr Trump’s company had expected to sustain $2m in losses after opening the posh project in the first four months of 2017. Instead, it turned a $2m profit. PARIS – The French government has just announced the guidelines for a new labor code, its first major reform to boost France’s economy, by giving more flexibility to companies to adapt to the marketplace. The second major reform sought by President Emmanuel Macron’s cabinet – an overhaul of the French state – is set to follow. The changes to the labor code have four goals. First, direct negotiations between employers and employees in small and medium-size firms (accounting for 55% of the workforce) would be facilitated by allowing such companies to negotiate with elected representatives not mandated by the trade unions. Second, social dialogue within larger firms would be simplified by merging separate workers’ committees (for hygiene, health, safety, and so on) into a central body. Third, collective bargaining over wages and employment would be decentralized from national to sectoral and/or firm level. Finally, laying off employees would become easier and more predictable, in particular with the introduction of upper and lower levels on payouts issued by labor courts. The reform of the labor code will soon be accompanied by reforms of the unemployment insurance and job training systems. On the former, the government will take over from the unions, in order to provide unemployment benefits to all categories of workers, including the self-employed and those who voluntarily quit their current job to search for a new one. The cost of reforming unemployment insurance, however, is estimated at €3-5 billion ($3.6-6 billion), which may prove difficult to square with 2018 budget plans, which foresee a €20 billion cut in spending. Altogether, the labor market reform is intended to reconcile more flexibility for firms to hire and shed workers – which is needed in an economy where growth is driven by innovation and creative destruction – with more income security and more training for the unemployed. The French labor market currently suffers from a huge divide between qualified workers under long-term contracts and low-skill workers who shuttle constantly between unemployment and short-term jobs. The government’s reform is meant to close this divide by increasing social mobility. The second pillar of Macron’s economic program, reform of the state, has two major components: a revamp of fiscal policy and an overhaul of the public spending system. Here, too, the reform aims to address four main long-standing problems. First, capital income is too heavily taxed in France, compared to other developed countries, which discourages innovation and entrepreneurship. Second, public money is not invested in the most cost-effective and growth-enhancing way. Third, France suffers from a multiplicity of administrative layers, which generates inefficiencies and redundancies in the provision of public services. Finally, France remains a highly corporatist country, with a multiplicity of health, pension, and family subsidy systems; in an innovation-driven economy where individuals are likely to change jobs and sectors repeatedly over their lifetime, this bureaucratic thicket becomes a source of inefficiency and risk. On the fiscal front, Macron has made two important moves. First, on the revenue side, capital income would be taxed at a flat 30% rate, whereas before capital was taxed more than labor. Second, the wealth tax on non-real-estate assets will be eliminated – a move meant to encourage entrepreneurs and innovators. The government has not yet decided on a precise course of action for spending, although Macron and his team are looking closely at the reforms carried out by Canada and Sweden in the 1990s. In particular, the government may decide to reduce the number of civil servants by eliminating some administrative layers of regional and local government, and by delegating some administrative tasks to autonomous agencies. Moreover, the government may – and should – merge all existing pensions schemes into a single system (as it should with the social security, health insurance, and family subsidy systems). This would enable the government to invest in education, unemployment insurance, and innovation, while abiding by its European budgetary commitments. After decades during which France experienced slow growth, high unemployment, industrial decline, and rigid corporatist institutions blocking all attempts at reform, a new hope for change has emerged. Decisions made in the coming year will tell us whether this hope is to be fulfilled. For some residents of Seoul, the wall-to-wall coverage granted by western media to North Korea and its ever-expanding arsenal of ballistic missiles and verbal barbs is a source of bewilderment. Hunkered 50km from the most militarised border on the planet, these citizens have for decades lived with the threat of annihilation with stoic reserve. Pyongyang’s sabre-rattling, meanwhile, has captured the world’s attention, with each new threat sparking reportage, punditry and tweets from Donald Trump. In the process, many have overlooked developments in North Korea that could have greater consequences for the future of the reclusive nation than the words of the US president. Experts now recognise the North Korean economy is in the throes of a transformation, with the growth of both formal and informal markets, as well as private enterprise, boosting citizens’ wellbeing and defying notions of a state-run basket case. In Unveiling the North Korean Economy, Byung-Yeon Kim provides academic rigour and rare data in a book that should be required reading for policymakers or diplomats studying North Korea. Kim, a professor at Seoul National University, acknowledges the growing ubiquity of market trading, a phenomenon that took root informally following devastating famine in the 1990s but now becoming increasingly enmeshed in government plans. In 2013, Kim Jong Un set out his “byungjin line” — a policy of simultaneous development of the nation’s economy and nuclear weapons, and has since permitted almost 400 markets with more than 600,000 stalls. These are in addition to countless unofficial markets — or jangmadang — which while technically illegal now account for between 70 and 90 per cent of total household income, according to a host of studies. While the west has focused on the North Korean leader’s nuclear ambitions, the market reforms, combined with a tacit acceptance of private enterprises, have led to an uptick in wages and the standard of living of many citizens, complicating western efforts to sanction Pyongyang. The author is most compelling when outlining the longer-term ramifications of these developments for the Kim regime: “Markets will transform the structure of the economy and the mindsets of people . . . our analysis predicts that this subtle balance between the power of the markets and that of the state cannot sustain long term, and economic considerations will ultimately prevail among North Koreans.” Prof Kim believes the North Korean leader will at that point face a crucial decision: risk his own position in an aggressive bid to repress the market or loosen his grasp in what could be the beginning of a Chinese-style transition. Yet predicting Pyongyang is a fraught business, and part of the reason the North Korean economy has received comparatively little attention comes down to a lack of reliable information and credible macroeconomic data. Growth estimates can vary wildly. One example was gross domestic product per capita calculations for 2015, which ranged between -1 per cent (Bank of Korea in Seoul) and 9 per cent (Hyundai Research Institute). Last month, the South Korean central bank said the North’s economy in 2016 grew at 3.9 per cent — the fastest pace in 17 years. These findings echo Prof Kim’s of a gradual U-shape recovery of the North Korean economy after its slump through the 1990s. However, he cautions that Pyongyang “is far from recovering to pre-crisis economic performance”. In addition to macroeconomic analysis, Unveiling the North Korean Economy rewards the reader with fascinating nuggets gleaned from interviews with hundreds of North Korean refugees as well as businesses operating in the border region with China. These put paid to notions that North Koreans are dependent on state rations or that economic hardship is the primary factor motivating defections. Crucially, they also support data on wage growth; Prof Kim estimates the average monthly income from the informal economy is about 80 times that from official state jobs. The imperfect data are limited by obvious constraints. But for anyone seeking a deep understanding of North Korea, this is essential reading.